Blue diamonds are considered extremely rare and quite valuable. They are among the rarest colors in the color diamond family. Since blue diamonds are so unique, there are many questions that are frequently asked regarding their rarity, authenticity, color origin, and value. Here are several of these questions with relevant and insightful answers. 1. Are Blue Diamonds Real? Natural blue diamonds are absolutely real. Blue diamonds that have been found in nature with the blue coloring are “real.” Other diamonds that have been artificially treated to receive the blue coloring are not “real” even if they are authentic diamonds. There is a huge price difference between natural blue diamonds and artificially color enhanced blue diamonds. 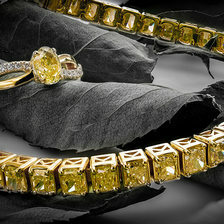 Additionally, the two types of diamonds have different tones. 2. 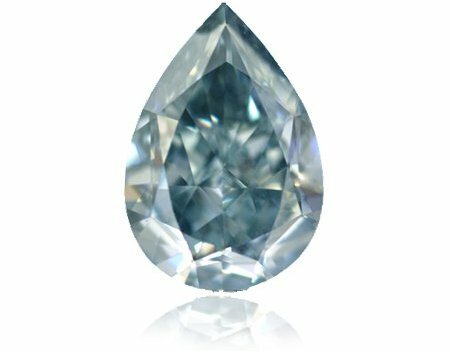 What is a natural Blue Diamond? A blue diamond is a genuine diamond that has not been treated or enhanced in order to receive its color. It is important to verify that the stone is natural by looking at the GIA certificate where it says origin. If it is a real blue diamond the origin will say “natural.” Blue diamonds come in several shades including straight blue, grayish blue, violet blue, and greenish blue. 3rd row: F. Vivid Greenish Blue, Fancy Green- Blue, F. Intense Green-Blue, F. Vivid Green- Blue, F. Deep Green- Blue, Fancy Greyish Greenish Blue. 3. How Rare are Blue Diamonds? With regards to the various different colors available, blue diamonds are among the rarest with Violet, Pink, and Red stones. In general, colored diamonds are much rarer than colorless diamonds, but some colors or more common than others such as yellow and champagne stones. Blue diamonds are Type IIb diamonds, which are extremely rare and valued very high. Most blue diamonds are rare, but blue diamonds with very high color intensity that display a deep blue color are the rarest. Of course large stones are even harder to come by and much pricier. 4. How Blue Diamonds are Made? Similar to all other fancy colored diamonds, natural blue diamonds are made by nature. Though the process that diamonds go through including cutting and polishing can have an effect on a diamond’s color, blue diamonds are actually found with their beautiful blue color tone. An impurity called boron, along with nitrogen, is the cause for the color. 5. How is the Blue Diamonds Formed? The formation of all diamonds is something that happens over millions if not billions of years. Under conditions of immense pressure and heat, Carbon elements form together into rough diamond rocks. The addition of the blue color is simply other elements that compound themselves together with the Carbon. Studies have shown high levels of Boron are the actual cause to the bluish tint, but other elements can have different affects as well depending on the levels that the stone contains. 6. Where do Blue Diamonds Come From? Blue diamonds are only found in a few mines around the world. These mines include the Cullinan mine near Pretoria, South Africa, and the Argyle mine in Australia. Once, blue diamonds were mined in India’s famous Golconda mine as well. 7. Are Blue Diamonds More Expensive than Other Colors? Blue diamonds are more valuable than most colored diamonds, but just like all other diamonds, their prices are determined based on the diamond’s color, color intensity, size, and clarity with an emphasis on the intensity of the color. Blue diamonds are highly sought after by diamond collectors and enthusiasts worldwide. A very small blue diamond can cost a few thousand dollars, and a large one such as the Wittelsbach-Graff diamond can cost millions. Because they are so rare, blue diamonds tend to get snatched up very quickly and fetch very steep prices. Nevertheless, no diamond collection is complete without a blue diamond. 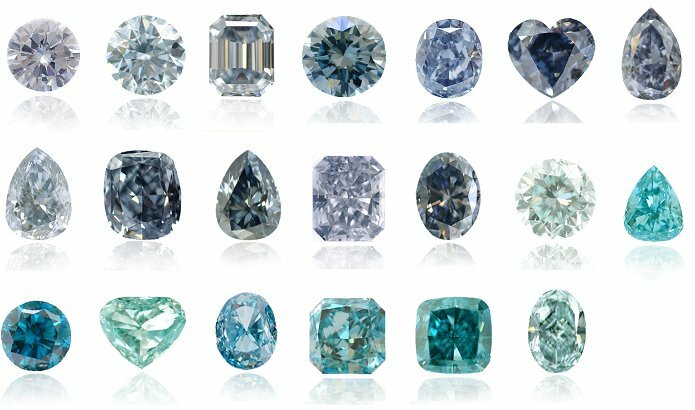 Blue diamonds grading scale varies from faint blue, very light blue, light blue, fancy light blue, fancy blue, fancy intense blue, fancy deep blue and fancy vivid blue (as seen in the image above), and derive their color from boron impurities. As the content of boron increases, so does the intensity of the blue color. Sapphires can also display a variety of shades, from a pale sky blue to a rich, royal blue. 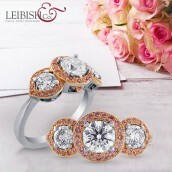 The higher the concentration of titanium in the sapphire, the more saturated the hue. While blue is the most traditional and classic color for sapphire, Sapphires are actually found in a variety of different colors. The best way to know for sure whether you are looking at a blue diamond or a blue sapphire is to have a certified gemologist or gem lab examine it for you. 9. What Are The Prices of Blue Diamond Rings? It is no surprise that more and more people these days are looking for blue diamond engagement rings, as not only does blue symbolizes loyalty and trust, but it is also one of the rarest color diamonds in existence. 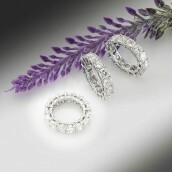 It is also a symbol of wealth and associated with royalty. Unfortunately, it is quite challenging to find natural, blue diamond rings in today's market as these stones are so rare. If you manage to find a blue diamond ring, or if you choose to build your own, by first choosing the diamond and then creating the setting, you can expect to pay a hefty price, due to their rarity and increasing desireability. Dive into an ocean of colors and find the blue diamonds that suit you best.